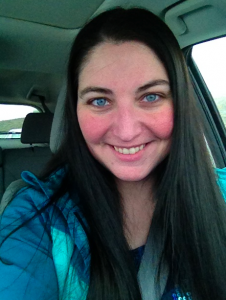 As mentioned in some previous posts, I was selected by Ken Garff Honda of Orem to test drive a 2013 Honda CRV for a bloggers promotion called the Honda Test Drive (or #HondaTestDrive on social media). I’ve been a Honda fan for my whole life. My parents owned Honda vehicles all through my life. They were driving a CVCC when I was born, they have a Civic and an Odyssey in the garage, and they’ve had several other Hondas in the 30+ years in-between. 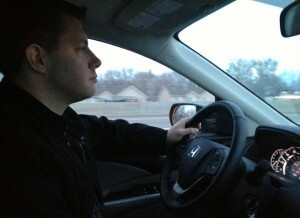 I learned to drive in a 1995 Civic. Personally, I’ve owned a 2000 Civic, 2001 Civic, 1997 Accord, and a 2006 Fit (and a 2000 Acura Integra, which is essentially a Honda). 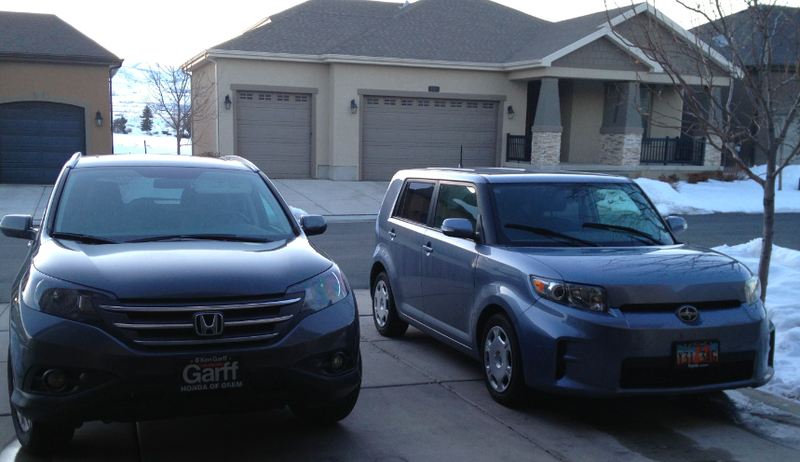 We currently drive a Toyota Camry and a Scion xB, but we made hard decisions against Accords, Elements, and CRVs in the past. 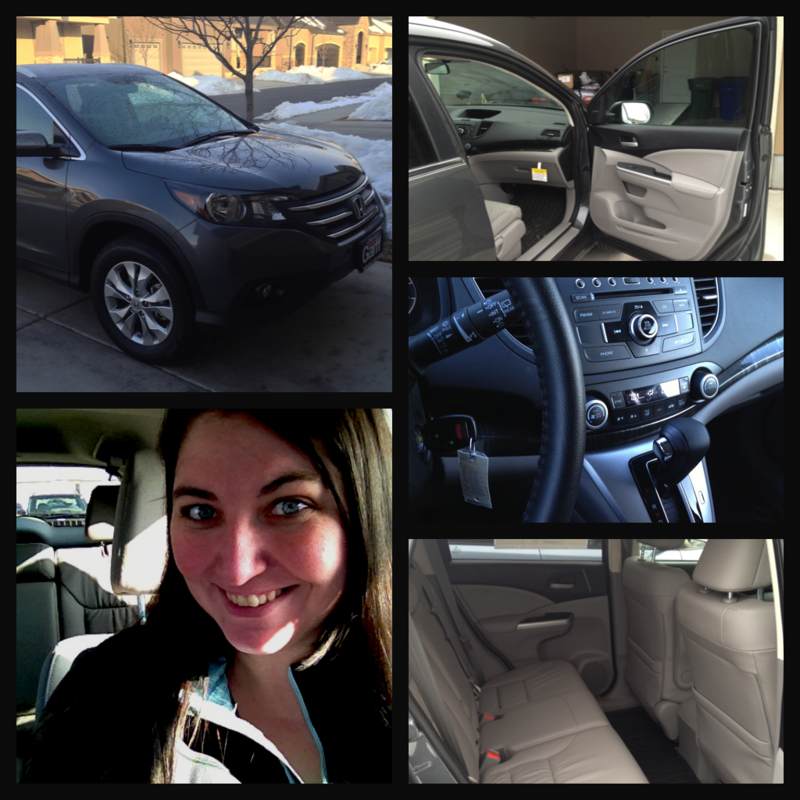 The folks from Honda of Orem brought the 2013 AWD Honda CRV EX-L to my office on February 4th, the day before my birthday. They came with a vehicle with 300 miles on the odometer, with a full tank of gas. They showed me all of the special features of the vehicle, set up my iPhone to sync with the BlueTooth system, signed some papers, and I was given free reign to enjoy the car. As tempted as I was to take off from work then and there, I had to stay at work a few more hours. The first thing I did once I got off work was drive home, pick up my family, and go for a joyride. We stopped by the 7-Eleven for a family #PDR, and drove around until we went out to dinner with my parents. My mom came in the car with us, and her comment about the CRV was “This seems just a little too nice for you.” Because she’s used to driving a 1995 Civic with windows that can no longer be manually rolled down, I could tell she was impressed by how posh the CRV was with all of it’s features. During the week, whenever Taylor was with me, he took the driver’s seat. That meant that I had time to sit in the passenger seat, and the backseat…and was pleased with how comfortable every part of the car is for passengers. I’m 5’10” and very leggy, and didn’t feel squished at all. Bluetooth hands-free link: It was awesome to have my iPhone synced up for calls, navigation, and streaming music. The downside is that Bluetooth streaming is killer on your phone battery, so I kept my phone plugged in every time I was in the car. 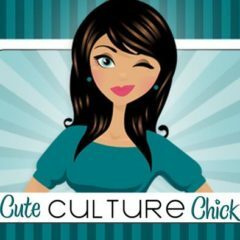 Bluetooth is only as good as it’s connectivity, so calls and music would drop out randomly…but that is more of a function of Bluetooth, not the system in the Honda. Heated leather seats: The weather was below freezing for almost my entire week with the CRV, so it was nice to have the heated seats. The seats got warm a lot faster than the rest of the car…so I didn’t have to freeze when I went out to my car on frosty mornings. Sound system: I’m a music junkie, and I always crank up the tunes in my car. The 328-Watt AM/FM/CD Audio System with 7 Speakers and subwoofer kept me rocking out in style as I sang along to my tunes in the car. I had the car for a total of 8 days, and drove approximately 500 miles. I started out with a full gas tank, and needed to fill it up after about 290 miles. I put in $65 worth of gas on my fourth day, around 18 gallons, and I was almost back to empty when the car was returned. Most of my driving was on the highway, and I averaged about 17 miles per gallon (95% of the time on Eco Assist). I know that new cars needs some time for the engines to wear in, and that fuel economy is compromised in very cold weather, but I expected slightly better gas mileage. 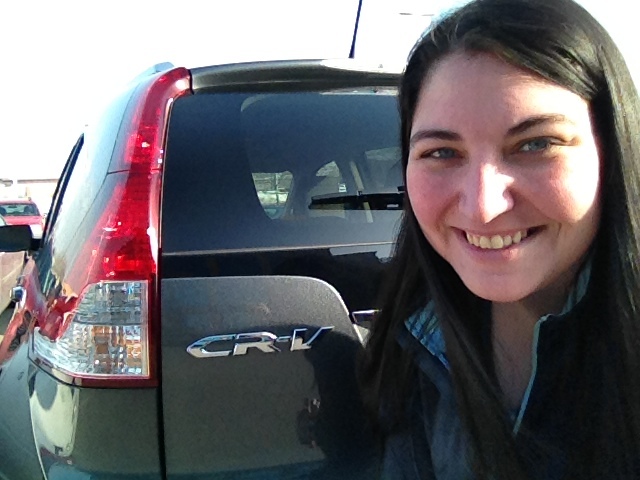 I really loved the chance I had to try out the CRV and get to know the staff at Honda of Orem. It was tough to go from the the super cushy CRV back to my Scion, but I didn’t miss the CRV’s gas mileage when I filled up the Scion’s tank the next morning (I average about 28 MPG) in it. Breaking up with the CRV was hard to do, but I’ll always have the memories of my the magical week of my 33rd birthday. FTC Disclosure: I was selected for this promotion by Ken Garff Honda of Orem and was given a 2013 Honda CRV to test drive for a week. I was not compensated beyond the free use of the vehicle for 8 days. All opinions are my own.